Wayne Terwilliger then and now. I love that picture with Maury Wills! He signed his first professional baseball contract, with the Cubs, in September, 1948, one month after Babe Ruth died. He reported to Des Moines Cubs. 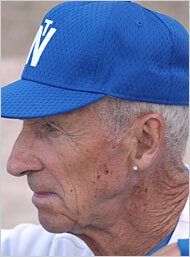 In 1949, Twig reported to spring training with the Los Angeles Cubs of the Triple A Pacific Coast League. By August he was the Chicago Cubs starting second baseman. 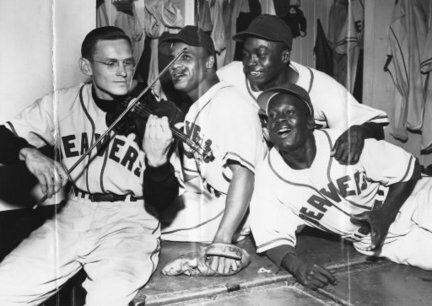 Terwilliger played nine seasons with five major league teams, mostly as a second baseman. He also played for six minor league teams, and managed 11 minor league teams. During his 12 years as a coach in the majors, he received World Series rings from the Minnesota Twins in 1987 and 1991. When Terwilliger was 18, he saw action with the Marines in the Pacific during World War II. As with all the living Brooklyn Dodger players that I have been researching and writing the Then and Now, this was also lots of fun reading about Twig. At the same time I learning about our Boys of Summer. Twig make a pact with Jim Hollars -the Cats’ chaplain, that if they won the championship, they’d both have their ears pierced. Well Jim’s wife said “Not on your life” but Twig said his wife (Lin) had always joked about him getting his ear pierced. Thankfully the list of Brooklyn players alive is still the same number as when I updated the list as of January 2013. The only thing is that I updated the list to include the years the players played for the Dodgers. 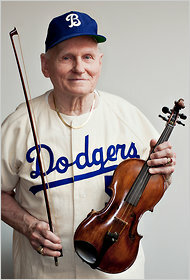 I got a comment asking me if I knew who of the Dodger players that are alive played with Jackie Robinson in 1947. Robert knew Ralph Branca did, but he wanted to know who else. The other two are Don Lund and Marv Rackley. So here is the updated list with what years each of these players played for the Dodgers. Clike on the following link to open the worksheet. P.S. 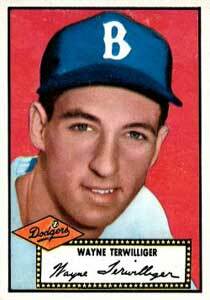 The next Brooklyn Dodger from this list that I will post about is Wayne Terwilliger. 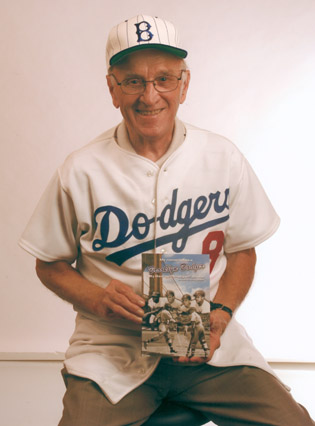 Getting back to my project of doing a post on all the surviving Brooklyn Dodgers. This one is #12 of 42 going from oldest to youngest. Charles Lemoine Thompson (Tim) was a catcher. He was born in Coalport, PA on March 1, 1924. His debut was on April 20, 1954 and his final Game April 27, 1958. He wore uniform #21. Tim, who had just two base hits in 13 at-bats for the Dodgers would spend the rest of the year with the Montreal Royals hitting .305 in 75 games. 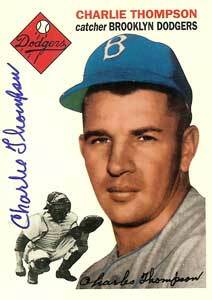 He spent 1955 with the St. Paul Saints of the American Association, hitting .313 and catching 121 games. This got him traded to the Kansas City Athletics on April 16, 1956 for Tom Saffell, Lee Wheat and cash. Thompson spent 1956 and 1957 with the Kansas City Athletics and would finish out his major league run with he Detroit Tigers in 1958 with a career .238 batting average in 187 games. He also finished with a fine fielding percentage of .990. Thompson would spend the remainder of his active baseball career with the AAA Toronto Maple Leafs retiring from active play after 1962 with a 14 year minor league career .293 batting average in 1,426 games and a fielding percentage of .991. Following a few years as a player-coach and manager at Toronto, he was a scout and later a supervisor of scouting for the St. Louis Cardinals from 1964 to 1994. He spent the rest of the 1990s in the Dodgers organization as a scout and since 2000 he has worked in the same capacity for the Baltimore Orioles. As of last notice he was residing in Lewiston, Pennsylvania. Note: I could not find a current picture of Mr. Thompson.